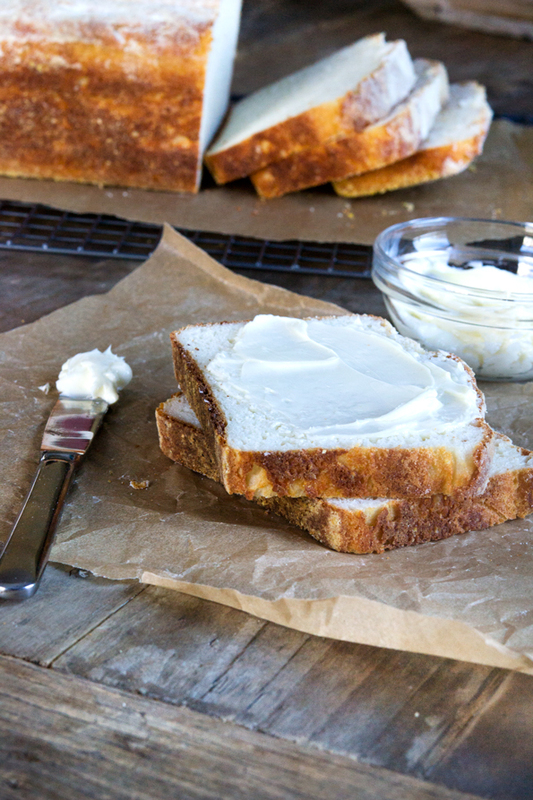 Home > Breads > Gluten Free English Muffin Bread—Easy GF Sandwich Bread! Light, tender and soft, with a soft crust, this gluten free English muffin bread is the easy white sandwich bread you’ve been searching for! There are plenty of gluten free bread recipes on this website. And I even wrote a whole book about gluten free bread. When I was trying to select the first of those sandwich bread recipes to do a how-to video for, this one was an easy choice. Not because it’s a difficult recipe. Instead, the fact that it’s maybe the easiest recipe is the whole point! This gluten free English muffin bread is an interesting example of yeast bread: it is a very wet dough that you don’t really shape in the “traditional” sense. But that’s not because it’s gluten free. That’s because of the nature of English Muffin Bread. It’s a super wet yeast dough, and moisture makes it double fast. Then, all that’s left is to scrape it into a loaf pan, smooth the top, cover it and let it rise. After just about 35 minutes in the oven, you’ll have an amazing loaf of soft and tender gluten free bread. To store it, slice it thickly (because it’s amazing that way! ), and place a small piece of parchment or waxed paper between each slice and the next before bagging and freezing. This is good practice with any bread that is high in moisture like this one, so the slices don’t stick to one another as they freeze. It’s not necessary with most of the other breads, though. If you need to be dairy free, there is a version of this bread recipe that does not use my bread flour formula, and can easily be made with dairy-free milk, in my first cookbook, Gluten Free on a Shoestring (page 106). A while back, I asked those of you on my (free!) email list a simple question: When it comes to gluten free baking, what’s your biggest struggle? Among the hundreds of responses, a few themes emerged. One of those themes was about your struggles with gluten free bread. And, like in conventional bread baking, the problem was most often with getting the bread to rise properly. It can be so frustrating! Baking yeast bread is very environment-dependent. So when I bake bread in the wintertime, it takes a bit longer to rise since the air is not only a bit colder, but quite a bit drier. If you live in a very dry climate year-round, you may even have to add a bit more moisture to your bread dough. One of the most common problems with baking bread in general (and a big part of my Bread FAQs) is dough that has dried out. If you let it rise without covering it, the dough will lose too much moisture and won’t rise properly. This gluten free English muffin bread is by nature a very wet dough. So not only does it rise quickly, but it will rise even in a drier environment. It’s still possible to dry it out enough that it won’t rise, but there’s a bigger margin for error. That’s like rising insurance! **For an explanation of what Expandex is, and where to find it both in and outside the U.S., please see the Resources section of the blog. In the bowl of your stand mixer, place the flour, yeast, and sugar, and use a handheld whisk to combine well. Add the salt, and whisk to combine. Add the milk and mix with the paddle attachment until the dough is smooth. It will be very wet. Cover the bowl with oiled plastic wrap, and set in a warm, draft-free location to rise until nearly doubled in size (about 40 minutes). You can skip this first rise and proceed right to the following step, if you prefer. The bread will just have a bit less flavor but it should not affect the final rise at all. Preheat your oven to 350°F. 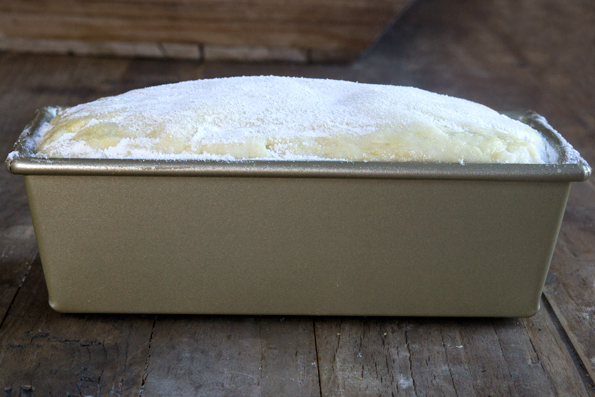 Grease well an 8 1/2 by 4 1/2-inch loaf pan and sprinkle the bottom and sides with cornmeal. Once the dough has doubled, stir it down to deflate it a bit. Scrape the dough into the prepared loaf pan, smooth the top with a wet spatula, and cover with oiled plastic wrap. Place in a warm, draft-free location to rise until the dough is about 1/2 inch above the sides of the pan (about 1 hour). Remove the plastic wrap from the loaf pan and slash down the center of the loaf at a 45 degree angle and about 1/4 inch deep with a sharp knife or lame. Sprinkle the top of the loaf lightly with cornmeal, and place it in the center of the preheated oven. Bake until the loaf is lightly golden brown, registers 185°F in the center on an instant-read thermometer, and sounds hollow when thumped on the bottom (about 35 minutes). Remove from the oven and allow to cool in the loaf pan for about 10 minutes before transferring to a wire rack to cool completely. Slice thickly and serve. From the book Gluten-Free on a Shoestring Bakes Bread: Biscuits, Bagels, Buns, and More by Nicole Hunn. Excerpted by arrangement with Da Capo Lifelong, a member of the Perseus Books Group. Copyright © 2013. Originally posted on the blog in 2013. Recipe unchanged, some photos new, video new. I was wondering if doubling your yellow cake recipe would be appropriate for a half sheet pan? Feel free to experiment, Pamela. I have only made that recipe as indicated in the instructions. Just reading through this and saw that you “put it in a cold oven, set the temperature, set the timer and waited 35 minutes”. The oven should be preheated. If you haven’t tried again, try preheating! I saw in an older post that someone stated that there is no Expandex in Canada. That is not true because I bought Expandex from a company at http://www.qualifirst.com which has an office in Eastern Canada and also Western Canada. Please see the Resources page on the blog for a description of Expandex, including tips on where/how to find it outside the U.S. I will also add that link to the recipe (which I thought I already had, and usually do in my bread flour recipes!). Beth, this recipe calls for my GF bread flour blend, which calls for whey protein isolate, a dairy product. As I state in the text of the post, if you’d like a dairy-free version of English Muffin Bread, I’m afraid you will need my first cookbook, as there is another recipe in there that can easily be made dairy free, without my bread flour blend. This sounds and looks wonderful can not wait to bake but just one question. My Grandsons are also dairy free so wondered can I use original almond milk in this recipe?? thank you so much. I’m curious as to why it is called “English Muffin” bread. Is it because it can be made into English Muffins? English muffin bread is an unenriched, plain yeast bread that doesn’t have much, if any, flavor from yeast development. I have Namaste foods Gluten Free Perfect Flour Blend. Can I use this for the flour as the first ingredient that you have listed or do I need to mix the different things together for this dough? Mabel, you must use the flour blend that I specify. And I’m afraid that, in general, Namaste flour blend will not work in my recipes. It’s an unbalanced, poor quality blend in my experience. I’m afraid that there is no effective substitute for tapioca starch. It’s very unique. Sorry! I am diabetic can I use Xylitol or Stevia instead of sugar also can I use coconut milk instead of regular milk? You need something to feed the yeast. It’s only a very small amount of sugar, and I’m afraid you need it. Coconut milk from the can is too thick. If you would like to use a nondairy milk, I recommend using unsweetened almond milk. 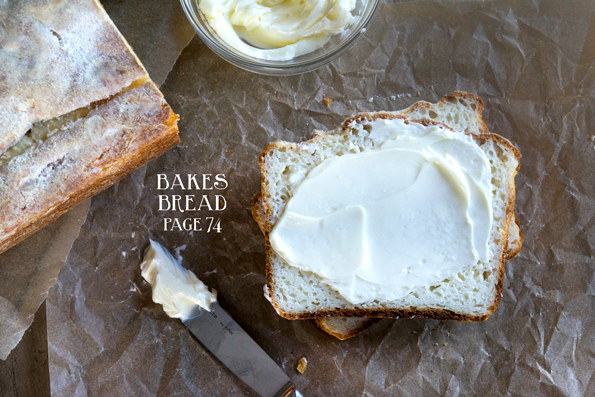 I’ve been making this English Muffin Bread ever since your bread book came out. I LOVE it! Not only is it super easy, but the taste is so rich and yummy!! Thanks so much!! My Expandex arrived 2 weeks ago, ordered the whey protein isolate and the cambro 2 qrt buckets for proofing. Been gathering up my goodies for the past few weeks. All of these things are part of my month long Christmas present. :-) i got new french rolling pin and pie roll out sheet for measuring. Plus a new oven thermometer. I am so excited!!! Thanks Nicole for all your hard work. Merry Christmas to you and yours! Hi, Stephanie, As the recipe explains, dusting the top of the loaf with flour yields a more even rise as it creates a cloak for the dough to rise into. Your oven temperature is certainly your culprit. ETA: Please see the Resources Page here on the blog for full instructions on how to use Ultratex 3 in place of Expandex in making my gluten free bread flour blend. Hi, Christy, I would try using the Better Than Cup4Cup blend on the blog, and substitute white rice flour for brown rice flour. The Make It Simpler flour is good, but it definitely absorbs more water than the High Quality Flour as it is not as well balanced as a more complex blend. Another Question– can we use Golden Syrup as a direct replacement for Honey i the bread recipes? That should work fine, but golden syrup is not acidic like honey so it could affect the final result. Feel free to experiment! 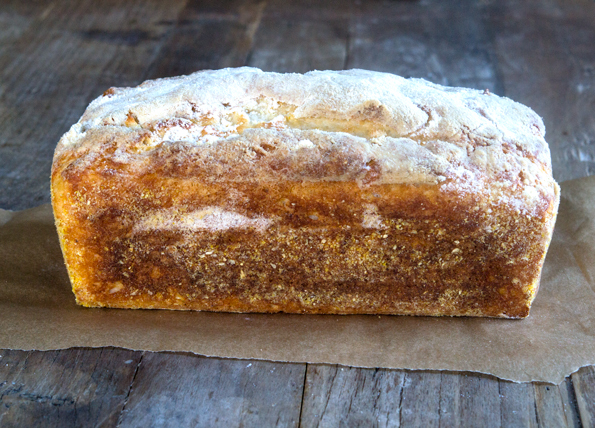 If you made it through the Monkey Bread, Samantha, you’re totally up for the English Muffin Bread! That Monkey Bread recipe makes a ton! So glad you loved it. Thanks for letting me know! Is there a way to make this dairy-free? I could probably use almond milk, but how do you substitute the whey protein? Bethany, I discuss dairy free alternative proteins, and how to use them, on pages 10-11 of the new book. I have made this bread, twice, and it is wonderful! One of my favorites from before GF, and so glad to have it back. I even took a picture, that I will put up here someday. I live through you my sister in crime…..
That’s awesome, Ouida! Larry is super nice, for sure. And same-day ship is about as good as it gets! I think I might try this on Christmas morning! English muffins are my favorite! I LOVE YOU! The book is absolutely beautiful, well planned and thought out. The pictures were a must have and I thank you sincerely for putting your own money on the line for us. You are the greatest GF recipe developer, blogger, writer, photographer, cookbook writer, and queen that I know. I’ll follow you anywhere, my dear regardless of all the insensitive comments/questions you get. THANK YOU FROM THE BOTTOM (and top) OF MY HEART!!!! DrLovEee, I did, in fact, explain in an extensive post on the blog nearly a month before the book’s publication date what you will need to make the recipes in the book. That post is here: Getting Ready for Gluten Free on a Shoestring Bakes Bread. For sources for Expandex, which I have been pursuing for months on end to get ready, please see this page on the blog: Gluten Free Resources. As you’ll see on that link, I have found another source (one I had used for years and then disappeared, but my husband helped me find again just the other day, as I announced on Facebook) that has ample supply. Please click on that link for the telephone number to order by phone, 7 days a week. This one is Expandex free, correct? If so, I may just have to find my loaf pans in the garage and get to baking it! It isn’t, Mare. It calls for Gluten Free Bread Flour, which is defined in the post as containing the same blend of all purpose flour + Expandex + whey protein isolate as the other recipe I posted. Sorry! I edited my response because I saw the Expandex. I did post a question about the warm draft free environment though in that edited response. Yes the “warm draft-free environment” would be the heating pad and towel setup described in the book if you do not have a home proofer. Good question (and I’m so glad the pictures are helpful – you’ll get your sea legs and stop second-guessing in time, I bet)! I haven’t tired this recipe with the beaters, but I would actually be more inclined to have you do this one by hand. Just put as much elbow grease as possible into it, to get the sort of dough you see in the photos. The beaters will sort of “whip” the dough, something you definitely don’t want! Navan Foods says my expandex is in! I will be able to make this soon! I would like to say say THANK YOU THANK YOU THANK YOU for ALL of the pictures. All the step-by-step pictures are incredibly helpful to a newb like myself and eliminate lots of questions like is my dough/batter too dry/wet, how much flour am I suppose to “dust” with, is it suppose to look like this at this stage?, etc. (I do alot of 2nd guessing). Speaking of newb questions…I only have a kitchenaid hand mixer with the standard beaters that it comes with and I got the dough hooks. Can I use the beater attachment is place of the paddle attachment in a stand mixer? I don’t think there is a paddle equivalent for a hand mixer. I can smell this bread. I can actually look at it and smell it directly through my monitor. This will be the second bread I try (the first being the pizza dough) as soon as my ingredients arrive! Half of them should be here today and half before the week is out. And YES. I may be making pizza for Xmas dinner!!!! Pizza for Christmas sounds like a good decision, John! Can the cornmeal be left out or replaced? We have a corn allergy here. Hi, Holly, You could use something else with a coarse grain, if you like, but it’s fine if you just leave it out. Maybe … oat flour?